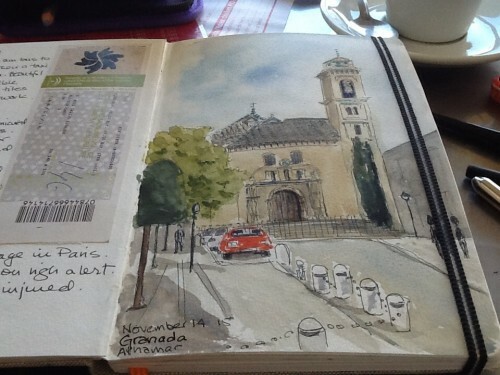 I am home again after 2+ weeks in the south of Spain and France. 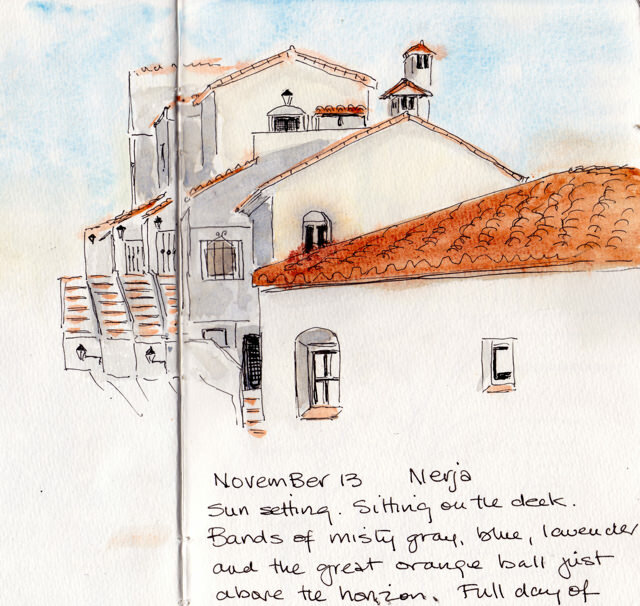 We stayed for a week in Nerja, a small town right on the Mediterranean. 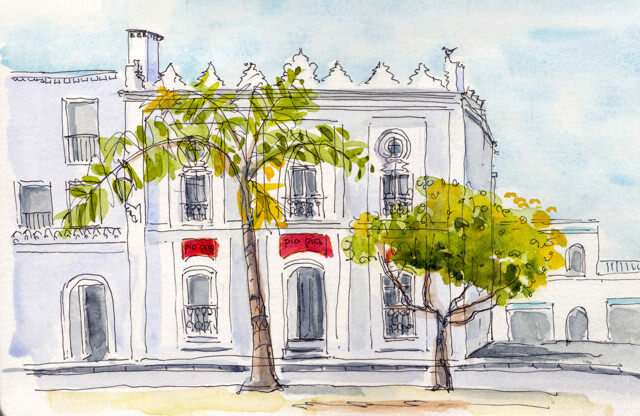 We walked everywhere and every chance I had I tried to sketch the architecture, whether from a cafe, from the many marble benches or from our own terrace. 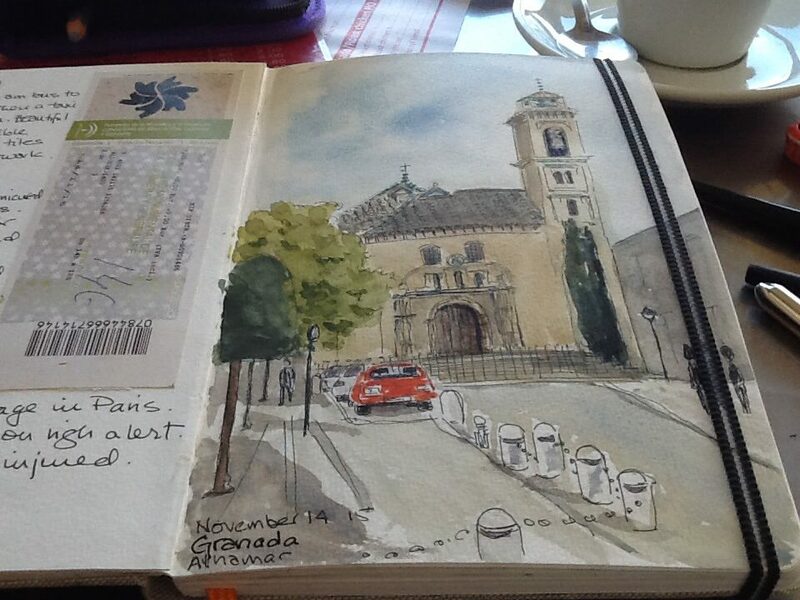 It was warm and sunny the whole time we were in Spain–perfect sketching weather. 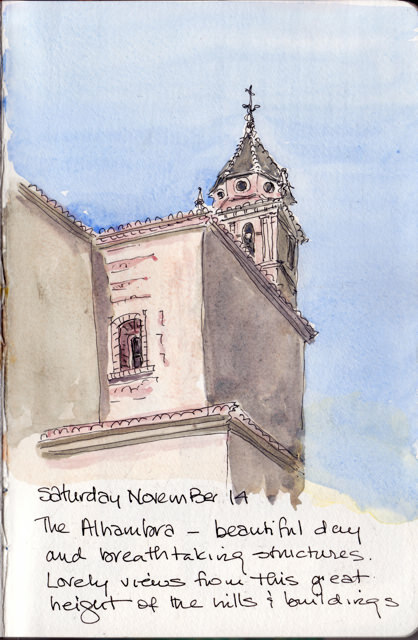 Using Nerja as a base, we travelled out to see the marvellous Granada and Cordoba–but were also happy wandering through the market and the streets of Nerja. Pio Pio was a favourite spot to have a cafe or an omelet. Its playful frieze was just asking to be sketched. 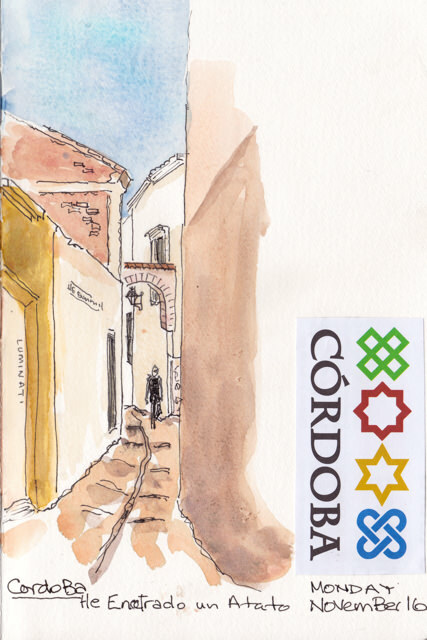 We also headed out on bus and train to Granada to see the Alhambra (magnificent) and to Cordoba to see the breathtaking ancient, mosque/cathedral with its endless rust and cream arches and walled garden full of orange trees. Again, so many amazing things to sketch and so little time. 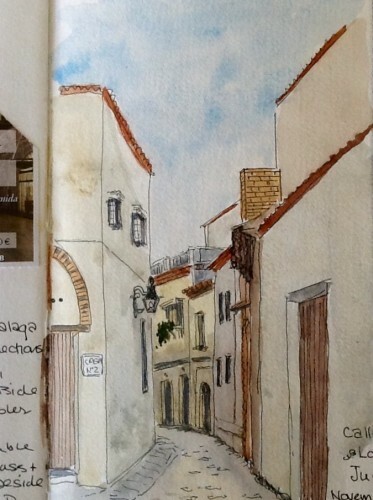 I loved the many shades of pink and yellow of the walls, and of course the red tiled roofs. Here are the sketches I finished, the first sitting in a cafe, the other three standing, leaning against a wall. I got the sketches done on site, but often added the paint later. I am in a cafe in a small town near Malaga. It feels far away from the events in France and Germany which I am following when I can connect to wifi. 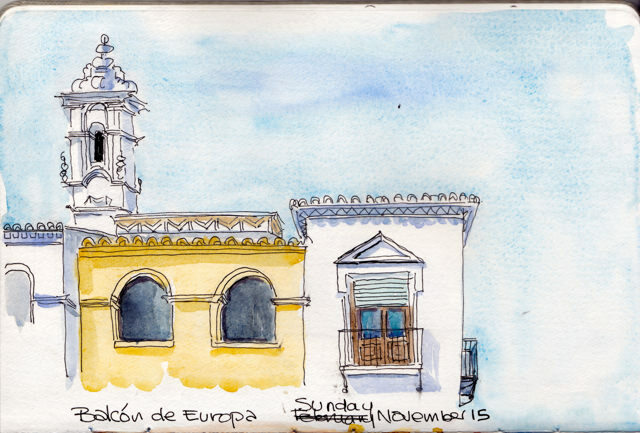 We are at the end of our first week on the south coast of Spain. Warm friendly people, stunning weather and breath-taking ancient buildings, so beautifully restored. One feels a great respect for history and an acknowledgement of various cultures and beliefs. 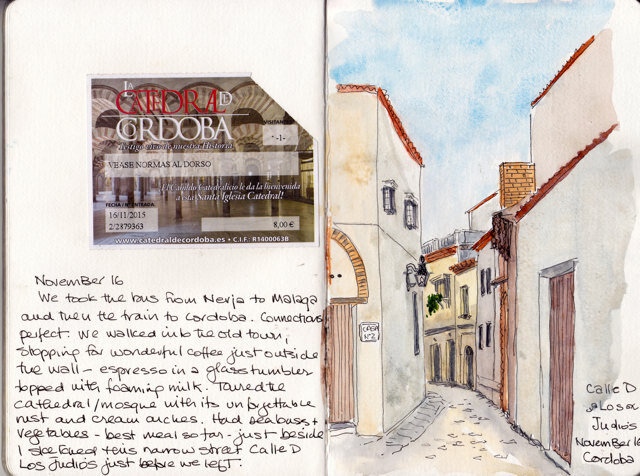 Below are two sketches, the first from Granada and the second Cordoba. 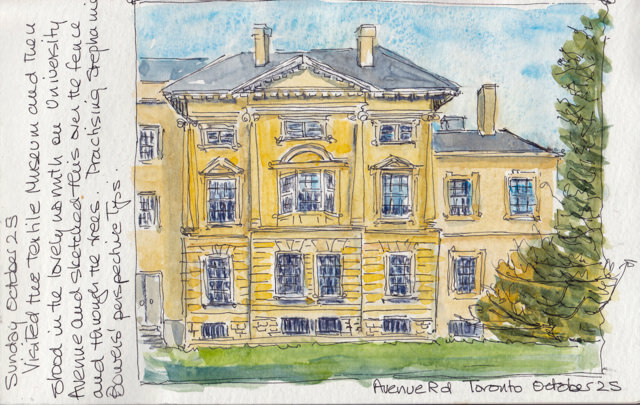 I sat in the sun just outside the north wall of the old court house earlier this week to sketch a portion of Bellevue Terrace. Various people came out to chat and give me the history of the building. Apparently it is now carved up into condos instead of being a series of adjoined homes. However, the architecture is in tact, a rarity in my city, and I just love to study the details. I’m finding red brick a bit of a challenge as you can see, especially the shadows. Will keep at it and try not to overwork it. May try this building again this week. 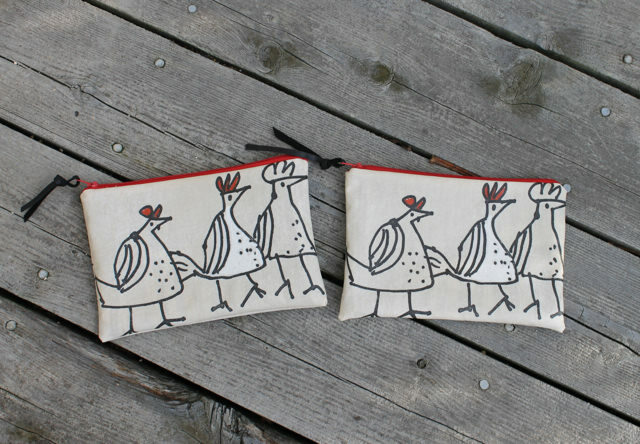 I went to Picton on Friday to attend the Maker’s Hand show. 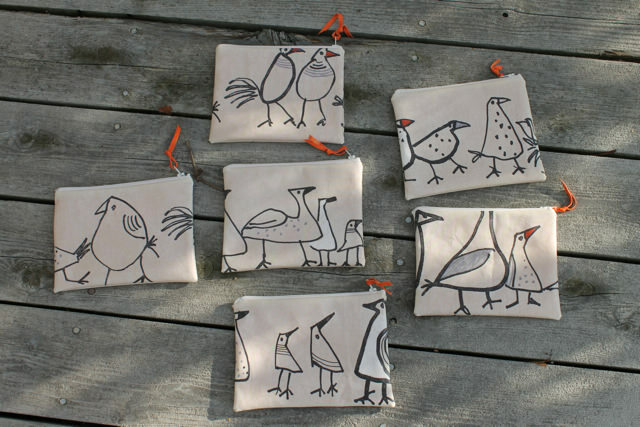 This show of artisans’ work is getting more and more popular. I arrived an hour after opening and had to really search for a parking spot. It is a bustling show with much beautiful work. It’s great to immerse in it and talk to the artisans. 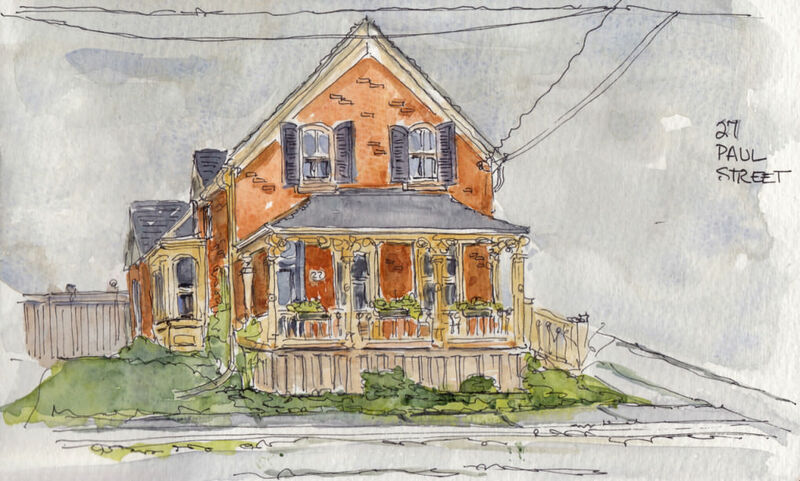 From there I found another Victorian house to sketch. 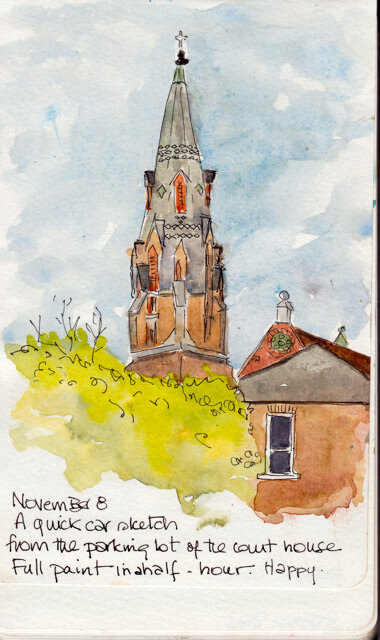 It was a dark, overcast day so I parked across the road and sketched from the car. 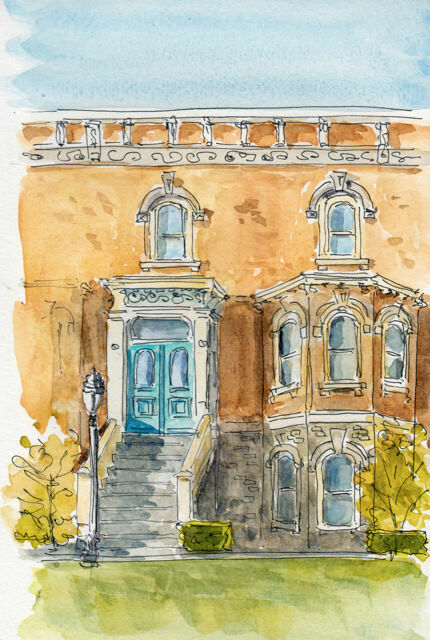 My sketch doesn’t do justice to the beautiful restoration of this late 19th Century home. As I was sketching, the owner came out to see what I was doing and invited me in for a tour. I am always amazed at the wonderful connections which come when I pull out my sketchbook. 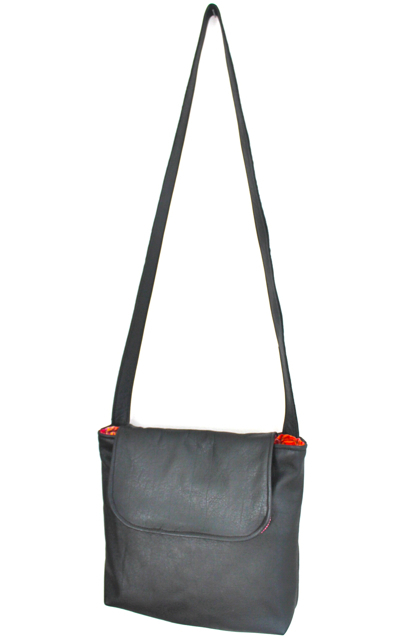 I had an order for a low-profile black bag, with a flash of hidden colour, 10″ x 8″ x 2″ with good storage and a cross body strap. 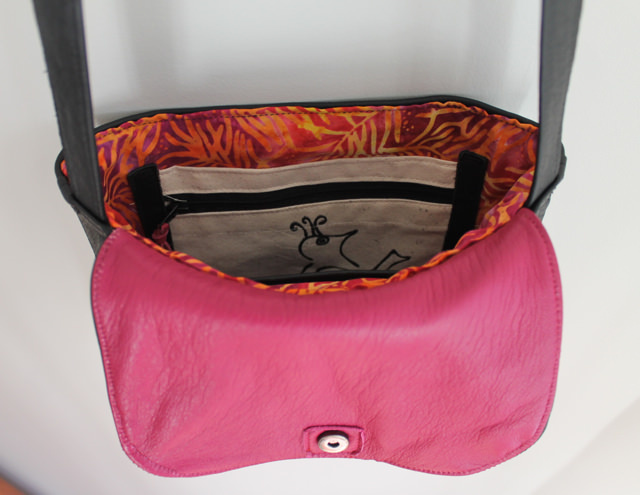 And here it is, made of black bison and lined in bright pink leather and pink and orange batik. 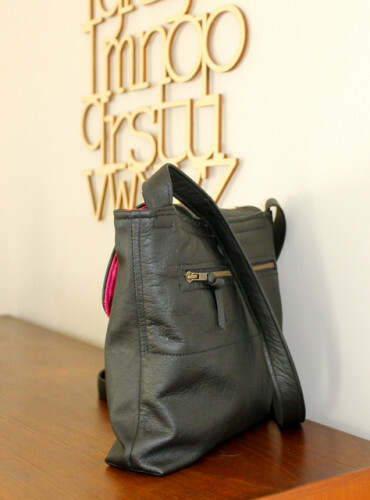 It has a zippered pocket on the back and a zip/slip pocket inside as well as a leather phone pocket. 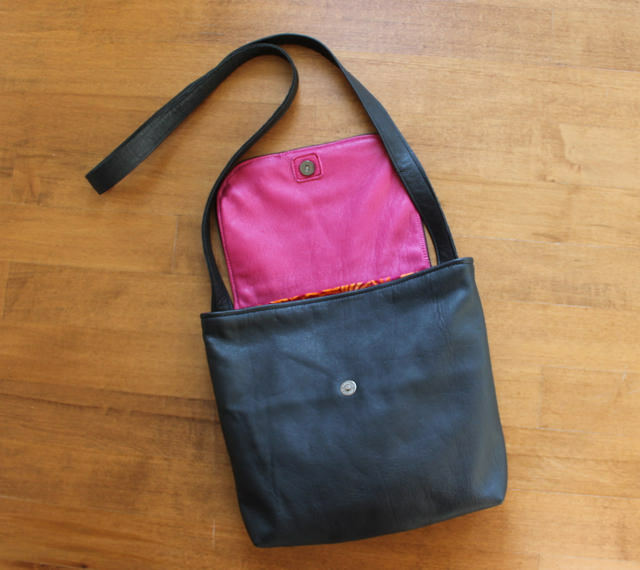 This bag features no hardware, save the magnetic catch–the simple stitching keeps the bag simple and elegant. A great small day bag for your essentials, or transitions perfectly for an evening out. 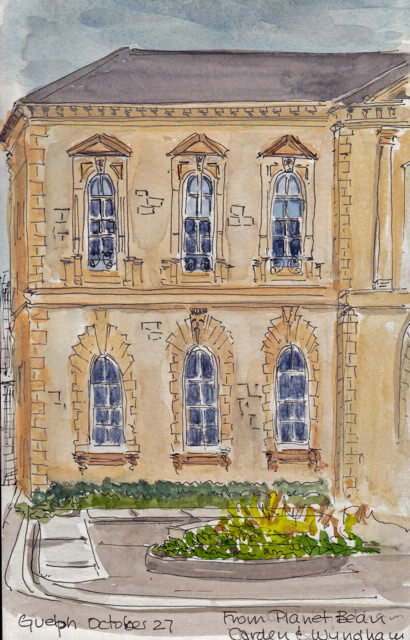 I sat in a nook of the archways across the road to sketch this view of the Jamieson Bone building. 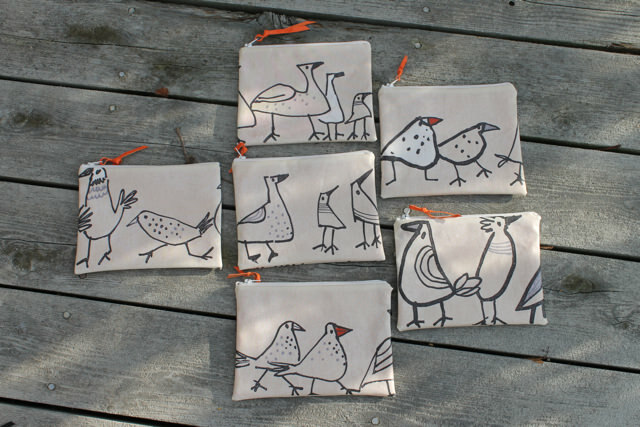 I have been taking a Craftsy course with Stephanie Bowers and it is really good. She demonstrates how to look at a building and break it into the big shapes, how to find the eye level line and from there to sketch more accurately. I am not sure that it is improving my sketches but it is improving my confidence in the way I approach a sketch, thinking more about the actual composition, the placement on the page and perspective. I’m on my second viewing of the lessons and the concepts are taking root. 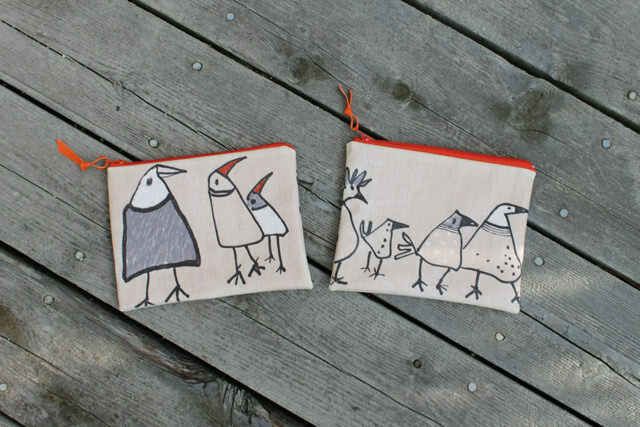 There are also classes on Craftsy by two of my favourite sketchers, Marc Holmes and Shari Blaukopf and I suggest you have a look at all of them. 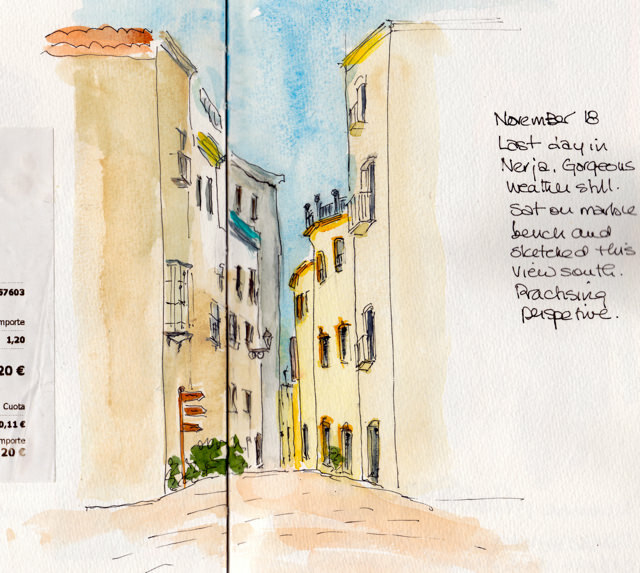 Each set of lessons, each bird’s-eye view of an artist’s sketching style, actually leads you more into your own sketching style, refines how you see and depict the world. I was away last week on a short road trip and I sketched as much as I could. 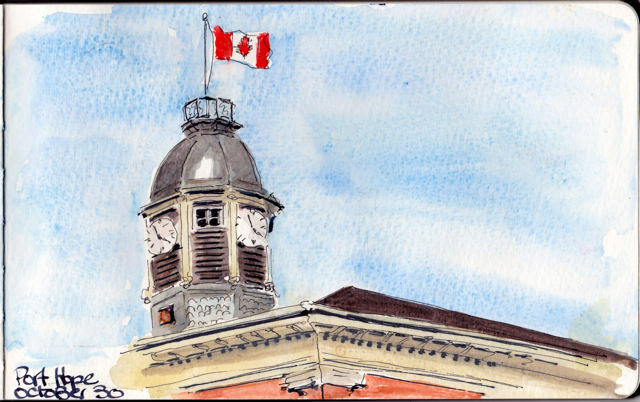 Here are the sketches from Toronto, Guelph, and Port Hope. 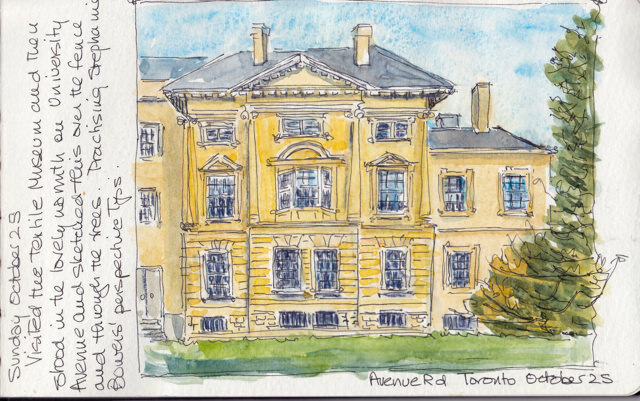 In Toronto I stood on sunny Avenue Road after my visit to the Textile Museum for this elevation view. 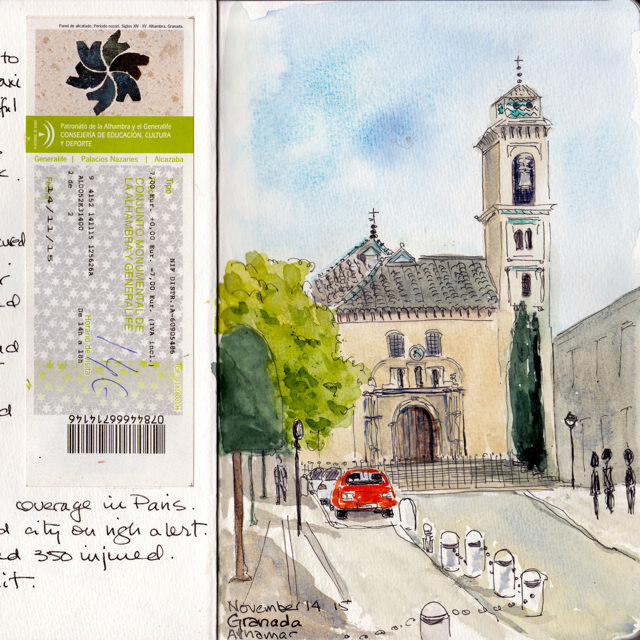 It was Sunday and the pace, and parking, were much easier. In Guelph I was in a cafe opposite the historic City Hall. 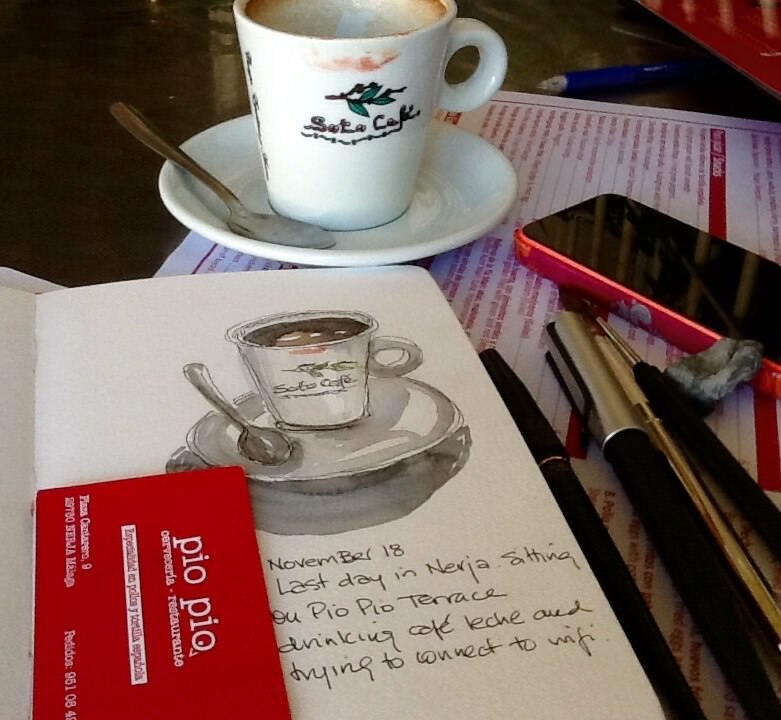 A table and a cappuccino make one of the most comfortable ways to sketch. And in Port Hope, I sat on my trusty stool in the parking lot. Each time I measured out the proportions with my pencil and did the pencil and then ink sketch. Paint was added later. 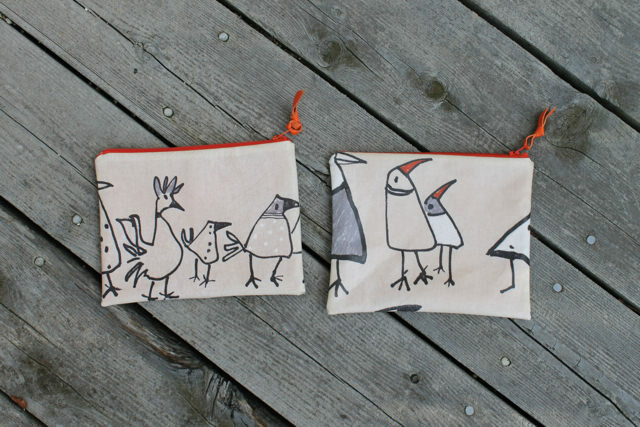 I was delighted the bird pouches flew out of the online store with more orders that followed. I have filled the orders and made another batch, but these are all for now. 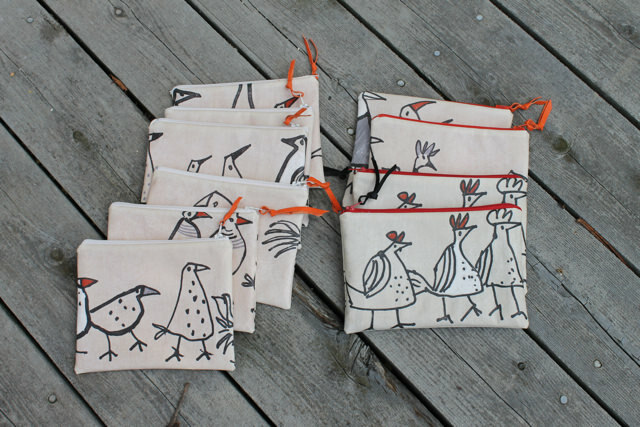 Here they are all together so you can get a sense of the design variety. This is the same coated canvas with water-resistant linings. They will be in the on-line store by Tuesday, but if you see one you love, just send me a note describing it and I’ll save it for you. There are six in the first group. These are all lined in orange waxed canvas and are approximately 6″ high and 7″ wide with natural zippers and orange leather pull tabs. And here is the reverse side of the ones above. And finally a pair with red zippers. lined with crisp blue and white striped material. 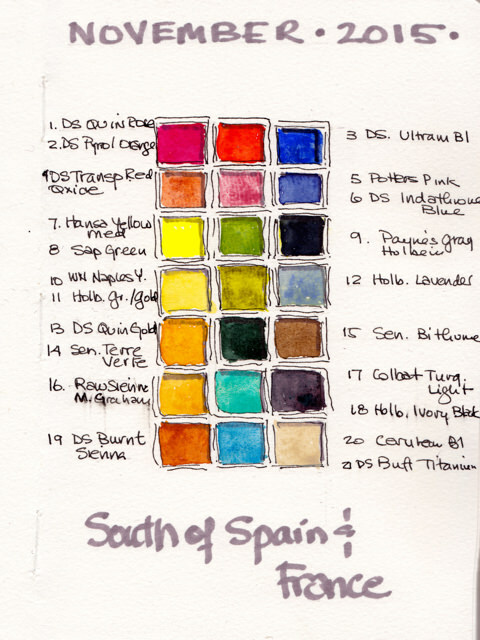 8″ x 5.5″. 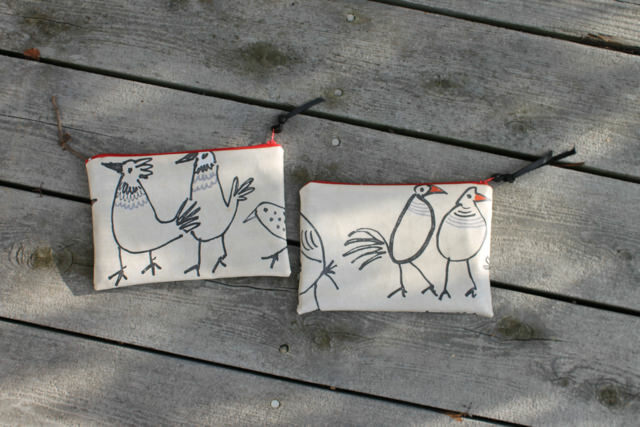 I love all of these wonky birds, but this trio is my favourite. They just make me smile.